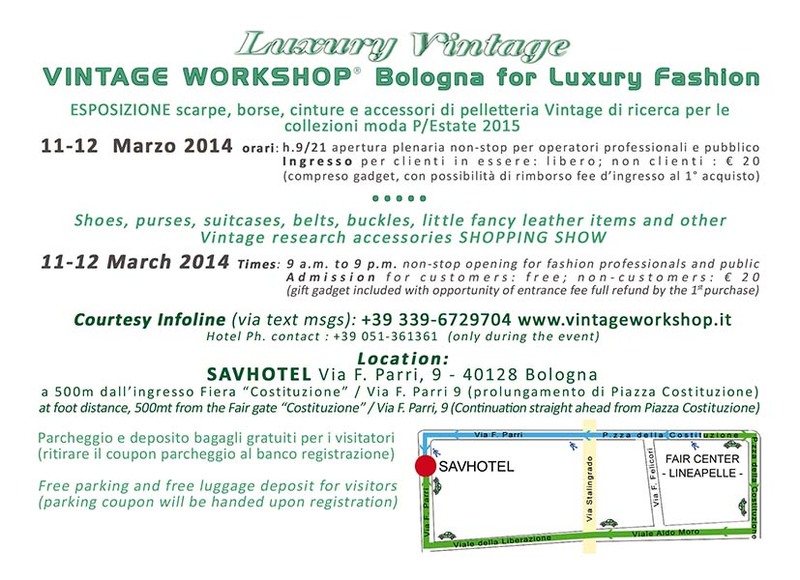 The exclusive show “Luxury Vintage Workshop® Bologna”, organized by the Italian Association of the Vintage Hunters will be held again in Bologna to exhibit for sale (and rent) a wide range of research period accessories, shoes, purses, travel bags, belts, buckles and metal ware (studs, fastenings, hooks…). The show is dedicated to inspire and help focusing creativity for the top fashion brands, high fashion collections, for the limited luxury editions as well as for the researches aimed at the Ready-to-Wear runaways. This technical event, based in Italy and unique in its genre all over Europe, has reached its 41st edition in the different formats presented in Milano, Bologna, Firenze and Marche region. It is especially addressed at inspiring fashion pros, designers, stylists, buyers and shoes, bags, accessories and/or metal ware parts manufacturers but also welcomes private fans of top quality Vintage, University and Master scholars and your emerging designers. Luxury Vintage Workshop® Bologna will take place in a at the exhibiting hall of the SAVHOTEL Bologna-Fiera, at few hundreds meters from the LINEAPELLE Fair gate “Costituzione”, offering to an international audience a great chance to see several rare and highly sought after period exemplars impossible to see elsewhere, lending a variety of creative hints, ideas, clues, atmospheres, moods focused on the future collections S/Summer 2015. 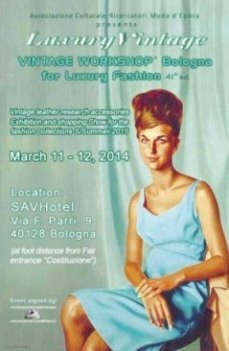 This collective exhibition and sale is able to always display a good choice of one of the European largest and most comprehensive Vintage purses and shoes collections, a selection which is steadily in progress, constantly enhanced with new assortments by its founders. Visitors will also have the chance to review a total new selection of recently hunted Vintage one-of-a-kind and collectable pieces, as well as the newly acquired rarest or most unique exemplars from the Vintage Workshop® Accessories Archives that will immediately be available for rent with ready pick-up on the spot. The exhibited accessories are in different materials from various proveniences iworld over with a special attention to “made in Italy” and European period pieces. A special area will be dedicated to some moods that the organizing association and members forecast as possibly future fashion trends to be intercepted and captured: the Post-Punk, Dark atmospheric, Steam Punk, Industrial and new Urban Cyber that the Vintage Workshop project deviser, Angela Eupani, called “CYS” or Cyber Citizens. This way, the show will offer a view opportunity not to be missed to connoisseurs, Vintage addicts, collectors, shoppers and in general to very discerning visitors extremely keen on quality original Vintage. A highly skilled multilingual staff, well experienced in Vintage research, will be at disposal of all visitors for any pieces of information and knowledgeable explanation concerning the goods on display, for short-term enquiries of style consultancy as well as for any requests to organize presentations, workshops or exhibitions on demand about different topics of period fashion. Good to know that Vintage Workshop® isn’t either a fair or a market, it is rather a technical event unique in its genre, patented with registered trademark, with the format of both a working/commercial show and an educational workshop offering to visitors the privilege to view and eventually buy or rent highly creative period accessories. AN EVEN GREATER CARE FOR VISITORS: free Wireless + Internet Point available in the next-door Lounge of the hotel. The event organizers will supplementary honour guests with two extra Courtesy services: free luggage deposit and complimentary guarded parking can be requested directly at the show hospitality desk on the spot. - Usual ongoing customers: free entrance on both days. - professional and private visitors, specialty stores owners (non-clients): admission fee €20/each payable cash on the spot with entrance anytime from 9am to 9 pm of both days (last admission 8.30pm). Possibility of entrance fee full refund by the 1st purchase. The entrance fee at regular price will enable to receive a free gadget that will be handed over directly at the hospitality desk (subject to availability). Reduced fare at €16 for Seniors over 65 and for students attending any Fashion Institute, Fashion University Faculties, DAMS and Academies of Arts, provided they show their student badge and identity card at the hospitality desk (mandatory). Organizers emphasize the unmissable opportunity for students and recent graduates of the fashion Universities and Institutes to take part in a workshop at a minimum token price and, besides, the chance of entrance fee refund on a minimum basis purchase. Opening times: see section “Admission Policy”. Location: de-luxe exhibition hall at the ground floor of the SAVHOTEL, modern 4-stars hotel premise in the neighbourhoods of the Fair district, at few hundreds meters from the Expo Entrance “Costituzione”. 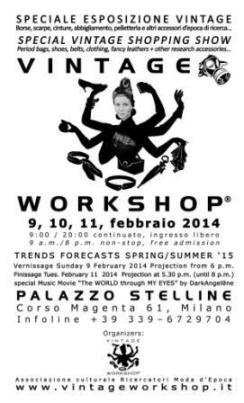 The venue is on Via Ferruccio Parri,9 40128 Bologna, Italy. Event signed by "Comunicazione e Marketing Perla", special projects and Development Division of the cultural Association “Italian Vintage Fashion Hunters” (Ricercatori Moda d'Epoca). Helping you protect your privacy online. Most content on the Internet-- from the latest political news to up-to-the-minute sports scores and stock quotes-- is free to consumers. Why? Because of effective Internet advertising. What makes Internet advertising effective is the use of technologies that allow advertising networks to make inferences about consumer tastes and provide relevant content. Because of the seemingly complex nature of these technologies, many users have become concerned about their online privacy. Recognizing these concerns, the NAI has made consumer education a top priority. As part of that commitment, we have developed this site to help you safeguard your online privacy. Learn more about how to take control of your online experience. 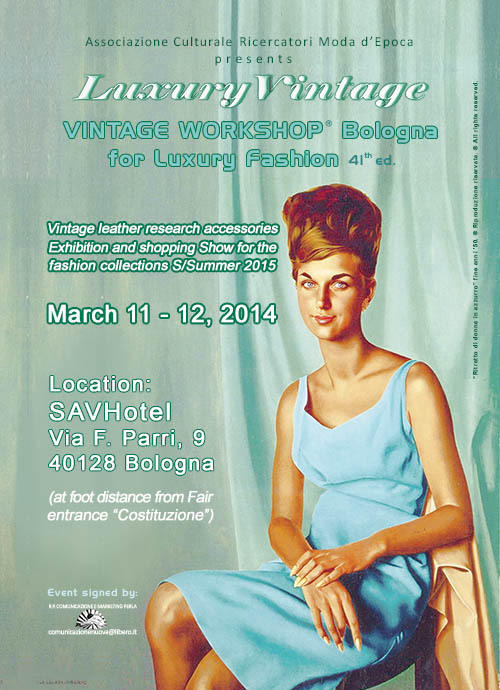 "VINTAGE EVENTS - The best and the unique about Fashion Vintage events of research" - non rappresenta una testata giornalistica in quanto viene aggiornato senza alcuna periodicità. Non può pertanto considerarsi un prodotto editoriale ai sensi della legge n. 62 del 7.03.2001. I testi appartengono all'autore e non possono essere replicati neanche parzialmente senza il suo consenso. Il resto del materiale pubblicato, dove non indicato espressamente, è copyright dei rispettivi legittimi proprietari, e ha il solo scopo di recensione/divulgazione. In ogni caso, come riportato a lato nella licenza, oltre al consenso dell'autore per la ripubblicazione di qualsiasi testo, articolo, comunicato, foto, video o opera intellettuale contenuta in questo blog é necessaria la citazione completa della fonte. Per ulteriori informazioni potete contattarmi all'indirizzo yahoo riportato a lato alla voce "Contacts", avendo cura di segnalarmi la vs. mail mediante commento su un mio post. February 2013 Awarded as Top Quality Blog! Choose your language + translate posts right away! NEXT LUXURY VINTAGE EVENT !! NEXT Vintage Show in Civitanova Marche!! Join my Google+ Plus circles to access more privileged text, photos and videos! In classifica top 40 blog! Next Vintage Show at the Castle Belgioioso: keyword "Maximalism"
Vintage Events by Stefano Wolf is licensed under a Creative Commons Attribution-NonCommercial-NoDerivs 3.0 Unported License.